Let’s face it…we are way past the day and age where you’d find a big yellow phone book and look up places to visit. Some might miss the good ol’ days. There is actually something special these days in getting a handwritten note in the mail, wouldn’t you agree? While some of those time-honored treasures are worth keeping around, there is also something so convenient about the digital age we are in and the vast amount of information we can have right at our fingertips. 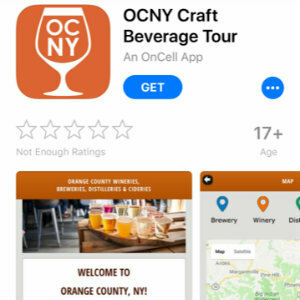 Today we wanted to tell you about a neat app that you may not know about yet – the Orange County New York Craft Beverage Tour App. This slick app is available on the Apple App Store on you can get it on Google Play depending on your mobile device. Just search “OCNY Craft Beverage Tour” and look for the orange square with white wine glass logo. This is a very handy tool for our guests who might have a proclivity towards craft beverages, wineries, distilleries and cideries in Orange County, which is where our bed and breakfast is located. There is a rich history of wine making in the Hudson Valley region and this app is a great tool to use to truly get a taste of the local flavor. When you open the app, you’ll be able to touch a “map” icon that will locate your position and then find nearby points of interest for you! So, right from your room in our b&b you’ll be able to plan out your next adventure. There is also a comprehensive list of wineries, breweries, cideries and distilleries. If a tour is what you’d like to do, there is a complete list of all of the tours available in the area. If you are concerned about driving or don’t have access to transportation the “ride options” link shows all sorts of transportation options from The Little Wine Bus to The Brew Bus and more. The Interactive Map and all other information listed will assist in helping you locate the places that best match your taste. If you are overwhelmed by all of the choices, just ask innkeepers John and Dena for some inside scoop on their personal favorites. We’d love to know if you download this app and find it helpful so we can share your experience with other guests too so comment below! It is always the right time to book a vacation to the Hudson Valley. Read about our inn’s amazing history and book your next stay with us online today.